While I'm not going to fight over the advantages of the .45 ACP as a defensive cartridge, I will put the gloves on when it comes to another favorite of mine: the .38 Super. More powerful than the 9mm Luger and easier to shoot than the famous .45, even though it is sandwiched between the two, the Super offers many shooters the benefits of both. Introduced by Colt in 1929, it was very impressive in the cartridge world because it had no problem reaching 1,300 fps at the muzzle. Some 83 years later the .38 Super is still with us, albeit pushed aside by some of the more modern cartridges. But nevertheless it has its followers--particularly among the competition set--and several gun companies are still chambering it. The gun has STI's "knuckle-relief" high-ride ambi safety and stainless beavertail grip safety. The front- and backstraps are checkered at 30 lpi. One of the more recent entries I came across recently is the STI Eagle, built on the 2011 frame and designed for defense and competition shooting alike. I was impressed with the overall appearance of the gun--the detailing, the fitting of all parts. The Eagle's slide is polished bright, which adds to the rich appearance of the gun, and the grip frame is finished matte. The fitting is well-done, with no rattling when you shake the gun, slide open or closed, with or without a magazine. The slide is one of STI's Classics, a five-inch with front and rear cocking serrations. It's CNC milled from 4140 carbon steel bar stock, and the ejection port is lowered and flared for flawless case ejection. "Eagle 5.0" is engraved on the right side of the slide; on the left are the letters "STI" surrounded by an outline of the state of Texas. Although the sides of the slide are highly polished, the top is matte finished to eliminate glare. The Eagle features a modular frame. The top portion is alloy steel; the trigger guard and grip are glass-filled polymer. The STI rear sights are fully adjustable target style with a well-defined notch and angled blade. The front sight is also competition bred, Patridge in design and offering just the right amount of light on each side when placed within the notch of the rear sight. The Eagle sports the customary beavertail safety, an ambi "knuckle-relief" serrated thumb safety and an extended magazine release. The latter is easy to manipulate, even with gloves on. The trigger guard is squared up and checkered for those who like to put an index finger there. The guard encloses a skeletonized trigger that incorporates a set screw for any overtravel adjustments you might care to make. The trigger broke at three pounds even and feels like a two-stage as there's a bit of travel before engaging the sear. The Eagle uses a bushing-less design. The muzzle has a slightly thicker diameter for excellent fit with the slide. As a 2011, the Eagle takes double-stack, high-capacity magazines, available (in .38 Super and 9mm) 15, 17, 20 and 26 rounds. The staggered-column design makes the grip wider than the usual 1911, and while it may take a bit of getting used to, I found the gun very pleasant to shoot and handle. 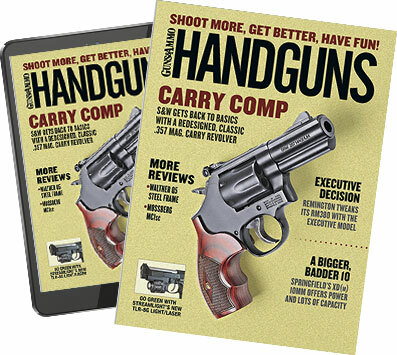 One bumpered magazine comes with the gun, and loading and reloading were a snap thanks to the magazine well. The Eagle's bull barrel has a fully supported chamber and polished feed ramp. There is no bushing; the barrel's diameter increases slightly at the end for a tight fit, a design that is inherently accurate. In concert with that, STI equips the gun with a Recoil Master guide rod, which makes it a soft-shooting pistol. Overall, I found the STI Eagle much to my liking. And the fact that it's chambered for the .38 Super puts it right at the top of my wish list.